One week after the (2007) CrossFit Games I was sitting around CF Santa Cruz and the topic of the top three male competitors came up. Someone marveled that they all performed at such high levels. As the discussions gained some steam I wondered to myself what they all have in common in the performance arena. The first thing that came to mind was the benchmark workout known as "Fran" (three rounds, at 21, 15, and 9 reps, respectively, of 95-pound thrusters and pull-ups). I knew for a fact that all three of them had a sub-3:00 "Fran" time. So I wondered what other benchmark performance numbers they put up. What does it take to compete with these three? What are some constants in their performances? And, are there certain benchmark workouts and exercises that act as indicators (and predictors) of broad fitness and capacity across diverse domains? Brett Marshall (known as "AFT") and James Fitzgerald ("OPT") flew in from Canada to compete in the Games. 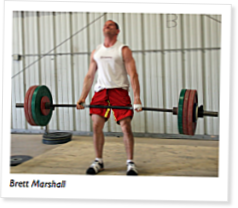 Marshall burst into the realm of the CrossFit elite with his sub-2:00 time on "Diane" (three rounds, 21, 15, and 9 reps, of 225px-pound deadlifts and handstand push-ups). His training partner, Fitzgerald, is equally impressive. Josh Everett, the head strength and conditioning coach for UC Riverside's athletic teams--drove up from Southern California. He is well known in the CrossFit world for his lifting prowess, his broad fitness, and his epic battles against Greg Amundson at "Fran." The games The first event, the Hopper, was won by Marshall. He dominated the workout, which consisted of a 100px0- meter row followed by five rounds of twenty-five pull- ups, and seven 135px-pound jerks. Fitzgerald took second, and third went to Chris Spealler from Salt Lake City. Everett rounded out the group in fourth place.The second event, the off-trail run, saw Spealler winning and Fitzgerald again taking second. Marshall came in third, and Everett finished in the top ten. In four years, the CrossFit Games have grown from a small event—“the Woodstock of fitness”—to a huge competition featuring elite athletes from all corners of the world. Dave Castro answers questions from Sevan Matossian in a casual interview at the Ranch, the location for the 2009 CrossFit Games. When this was written were the workouts for the 08 games already in mind? Excellent article by the way. this was my first time reading it. I didn't read back when it was originally published. Great stuff. It's amazing to read this and this about where the games were then, and where they are headed in 2010 & beyond!